On Friday, the Albuquerque Isotopes honor New Mexico's favorite foodstuff by changing their name to the Green Chile Cheeseburgers. "A lot of people like all the fixins, but I'm not a fan of tomatoes. I just like the burger, a little mustard, cheese, and it doesn't hurt to throw an onion ring on top. But it's all about the green chile." That's how John Traub, general manager of the Albuquerque Isotopes, describes his ideal green chile cheeseburger. It's a topic that evokes strong opinions from residents of Albuquerque and, for that matter, the entire state of New Mexico. 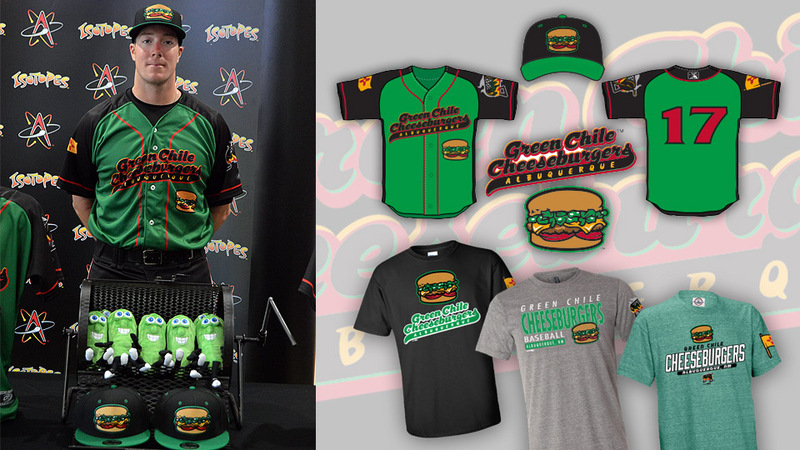 On Friday, the Isotopes are celebrating their region's profound love for cheeseburgers topped with roasted green chiles by changing their name to -- you guessed it -- the Green Chile Cheeseburgers. The team will take the field wearing specialty uniforms, on an evening in which their opponent, the Fresno Grizzlies, will compete as their recurring "Fresno Tacos" alter-ego. The Isotopes' "Green Chili Cheeseburgers" moniker was inspired by the success that other Minor League teams have had with temporary food-themed identities, especially the Lehigh Valley "Cheesesteaks" and aforementioned Fresno Tacos. "We worked with Brandiose to come up with the logo. It's a simple idea that has really taken off when it comes to merch," said Traub. "We've had a hard time keeping things stocked. We'll have enough to sell [at the ballpark] on Friday, but all around the community and the country -- around the world, even -- people have not wanted to wait." Green chile cheeseburgers will be available Friday, of course, both regular-size and sliders. The green chile cheeseburgers can be augmented with an order of green chile garlic fries, and dessert options include a peach and green chile flambe served over vanilla ice cream. "People here put green chile on everything," said Traub, going on to note that the state of New Mexico has even assembled a "Green Chile Cheeseburger Trail" featuring establishments that provide top-notch examples of this local culinary staple. So where can one find the best green chile cheeseburgers? "That's the bigger debate. Everyone has their favorite," said Traub, going on to name Albuquerque's Blake's Lotaburger and Monte Carlo Steak House as well as the Buckhorn Tavern in San Antonio, New Mexico. The Isotopes' one-night-only rebranding even prompted the mayor of Albuquerque, Richard J. Berry, to declare June 16 "Albuquerque Green Chile Cheeseburger Day." The declaration praises the Isotopes as an "integral part of the community" and green chile cheeseburgers as "one of the truly iconic culinary aspects of this community." "It's not just the cheeseburger. It's not just the green chiles," said Traub. "It's that those ingredients, together, are truly outstanding." Coming soon! 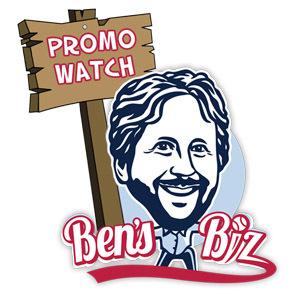 Per standard operating procedure, what follows is a meticulously curated list of other notable Minor League Baseball promos to keep an eye on this week. June 14: The Syracuse Chiefs' second annual LGBT "Pride Night" features a limited-edition Chiefs "Pride Night" hat giveaway. June 15: In advance of Father's Day, the Jacksonville Jumbo Shrimp stage "You Might Be the Father's Day." The team is giving away pregnancy tests, "so you'll know if you need to return for Sunday's Father's Day game." On "Late Late Night," the Lake Elsinore Storm "request the presence of Mr. Jimmy Kimmel." The Class A Short Season Northwest League kicks off its 2017 campaign. Hello, Northwest League! June 16: In recognition of the anniversary of John Glenn's signature space accomplishment, the Akron RubberDucks take the field in space shuttle suit replica jerseys. Luke Pell is visiting the Frederick Keys, because nothing says "A Night of Romance" more than a former Bachelorette contestant making an appearance at a Minor League Baseball game. On "1985 Bears Night," linebacker Otis Wilson and defensive tackle Mike Hampton will shuffle into the Kane County Cougars' home of Northwestern Medicine Field. Stubby Clapp played for the Memphis Redbirds from 1999-2002, and he's now in his first season managing the team. The Redbirds are honoring him with "Half and Half" jerseys incorporating both era's of Clapp's Memphis tenure. The Toledo Mud Hens may not have been the first team to unveil Sgt. Pepper's theme jerseys, but they are arguably the best. June 17: The Bowie Baysox are staging a "1K Beer Run." If you're curious about what it's like to run a 1K Beer Run, then please read this first-hand account. On "'90s Nickelodeon Night," the Carolina Mudcats are wearing Double Dare jerseys. This is the perfect attire for an early (Marc) Summer's evening. The Jacksonville Jumbo Shrimp are giving away neck pillows, and it feels safe to say that they are the most striking neck pillows ever to be distributed at a Minor League Baseball game. Madison Bumgarner and Buster Posey, longtime onfield BFFs, will be honored in "Dynamic Duo" bobblehead form by the San Jose Giants. June 19: The Class A Short Season New York-Penn League kicks off its 2017 campaign. Hello, New York-Penn League! The Rookie-level Pioneer League kicks off its 2017 campaign. Hello, Pioneer League!